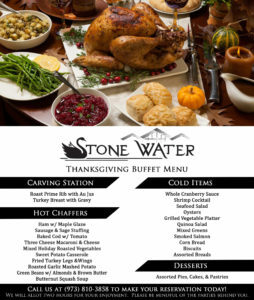 Make Your 2018 Stone Water Thanksgiving Reservations Today! Want to enjoy a traditional Thanksgiving meal without all the cooking and clean up? Join us on Thursday, November 22nd from 11 a.m. – 7 p.m. to indulge in all the traditional fixings. Buffet style; $45 per person. To make a reservation, call us at (973) 810-3858.